Like getting an Oscar and an Emmy!! 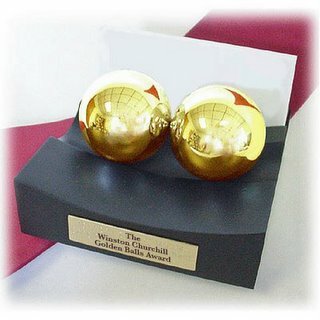 The Jyllands-Posten Newspaper has won the Victor Prize as well as The Winston Churchill Golden Balls Award. Quite an accomplishment by anyone's standards! Copenhagen - Danish newspaper Jyllands-Posten, which angered the Muslim world by publishing cartoons of Prophet Muhammad last year, has won a Danish critical journalism award for its initiative, the jury said. Denmark’s largest daily was honoured with the Victor Prize for “having opened everyone’s eyes by showing how easy it is to introduce cracks in freedom of expression and how so-called political correctness is infiltrating what we believe to be inalienable rights,” Hans Engell, the editor of tabloid Ekstra Bladet which awards the prize, said during a prize ceremony in Copenhagen late on Thursday. The Victor Prize, named for the late editor-in-chief of Ekstra Bladet Victor Andreasen, was handed to Jyllands-Posten’s editor Carsten Juste. “This prize is awarded to Jyllands-Posten for its adamant defence for months of freedom of expression, which is under threat,” Engell told AFP. “Jyllands-Posten only did its duty: exercise its right to freedom of expression,” he added. Juste, guarded by two secret service bodyguards, noted “how fragile freedom of expression is” as he accepted the award, his newspaper reported.